Lockheed Martin contracted Advanced Roofing and Advanced Green Technologies to design and build a massive 2.25 megawatt solar carport at the global security and aerospace company’s Mission Systems and Training facility in Clearwater, Florida. The project will be the largest private, non-utility owned solar array in Florida and is expected to produce 3.33 million kilowatt hours of electricity per year. The solar carport will cover 151, 400 square feet of the facility’s parking lot with 7,260 solar modules to provide shade for 534 cars. At completion, the project is expected to cut electricity purchases for the facility by up to 60 percent, according to Lockheed Martin’s estimates. 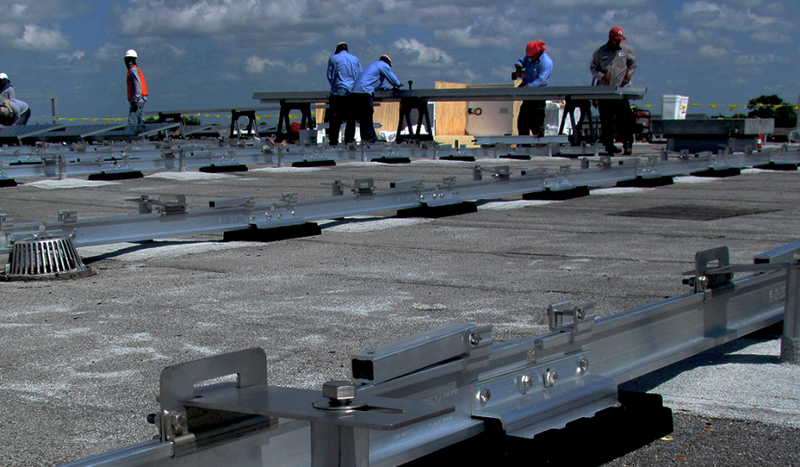 Advanced Roofing, Florida’s largest commercial solar contractor, competed with a field of national and Florida-based firms for the contract. The company will serve as general contractor, with sister firm Advanced Green Technologies providing construction and installation. “Since the facility’s operations will be in full swing throughout the construction schedule, precise phasing will be crucial to expedite our work and minimize disruption at the site,” said Clint Sockman, Vice President of Advanced Roofing and Advanced Green Technologies. As the state’s largest commercial re-roofing contractor, Advanced Roofing will draw on its decades of experience with large, complex projects at operational corporate, federal, healthcare, education, manufacturing and retail facilities. Construction of the fast-tracked, multi-phased project begins this month and will employ more than 40 workers on-site, with completion set for summer 2015. In addition to design, procurement and construction of the solar carport, Advanced Roofing’s contract includes resurfacing the entire 6.65-acre asphalt parking lot at the facility. Advanced Roofing will first resurface half the parking lot, and then install the carport’s foundations and structural steel superstructure. The contractor’s crews will then install the solar panel canopy, using high- efficiency Hanwha SolarOne S-series modules, and will add the full under-canopy LED lighting system. The first phase will be in use as the second-phase parking lot work commences. Throughout Florida and around the nation, offsetting energy costs with solar carports is a growing trend for corporate, healthcare, hotel and government facilities. A recent national study by GTM Research projected a 76 percent increase in solar carports from 2014’s estimated annual installed capacity of 180.2 megawatts to an estimated 318 megawatts in 2016. Commercial Building Owners this is your last opportunity to receive a $50,000 FPL Solar Rebate and 30% Federal Solar Tax Credit together for installing solar. We may never see incentive this good again in Florida. Advanced Green Technologies is pleased to announce that Florida Power and Light (FPL) will continue its Solar Rebate Program for 2015. Early applications will be accepted online starting January 14, 2015 at 8:30AM on a first come, first serve basis. In previous rounds, we’ve seen the $5 million dollar rebate fund exhausted very quickly – the last program filled up within minutes. 2015 is the last year commercial building owners can receive a $50,000 FPL Solar Rebate and 30% Federal Tax Credit together. Contact us today and submit your application early to ensure that your solar project comes to life before the sun sets on these incentives. One great part about pre-qualifying is that once approved you’ll receive funding guaranteed. Advanced Roofing and Advanced Green Technologies completed more than 100 solar installations in 2014. Our team is here to provide you with a complete solution from start to finish. Our commitment to quality ensures you receive the best customer experience by providing the most accurate solution for your needs using premium materials and award-winning craftsmanship. Join our many satisfied customers that have already seen the light. 100% Application Submission Success Rate. Let Us Show You How. We know some of you have missed out on the past FPL Solar Rebate offers due to technical difficulty and funds drying up. Our team has successfully submitted applications every round, and we would like to offer you training on how to submit yours. Call us today and we can walk you through the steps, or let us submit it for you. Advanced Green Technologies will continue its unwavering support to Junior Achievement World of South Florida Finance Park in Coconut Creek, Florida to continue educating the youth of South Florida about renewable energy. Advanced Green Technologies is proud to announce its continued support for Junior Achievement World of South Florida, Patten Family Foundation Finance Park on the campus of Broward College in Coconut Creek, Florida. Rob Kornahrens, President of Advanced Roofing, is a longtime supporter of Junior Achievement (JA) and a JA Business Hall of Fame Laureate. “It means a great deal to my family and I to be able to support this great organization”. It’s incredibly gratifying to know our contributions are helping educate the youth of South Florida about renewable energy and how effects the community,” stated Rob Kornahrens, Advanced Roofing President. Advanced Green Technologies (AGT) was established to transform the renewable energy industry by providing premier renewable energy solutions for commercial clients throughout North America and the Caribbean. The storefront is designed with renewable energy in mind and gives students the ability to learn about the importance of environmental responsibility. The AGT storefront includes various solar energy solutions along with interactive solar monitoring system and solar education center. “JA thanks Advanced Green Technologies and all of the other companies who continue to support the purpose of inspiring and preparing young people to succeed in a global economy,” mentioned JA World. In 2010, Advanced Green Technologies donated a solar energy system to JA World that’s located on their rooftop. The 175kW solar energy system provides the facility with clean energy and acts as a learning tool for students. Advanced Green Technologies (AGT Solar), a leading North American commercial solar contractor (i.e. solar installer and EPC) celebrates its seven year anniversary in the month of April. Headquartered in Fort Lauderdale, Florida, AGT Solar specializes in the design, procurement, and installation of commercial rooftop and ground-mounted solar photovoltaic systems. Since being founded n 2007 by Michael Kornahrens, the company’s deep commercial roofing heritage and relentless focus on quality have led it to be recognized by Solar Power Worldand GAF, as a leading expert in North America and the Caribbean for retrofitting commercial rooftops with solar photovoltaic (PV) systems. In seven years, AGT Solar has grown from a startup company with two employees to now employing more than fifteen full time solar professionals with offices in both Fort Lauderdale, Florida and Toronto, Ontario. To date, AGT Solar has completed 95 megawatts (MW) of solar PV installations and will look to complete an additional 98MW in 2014-15. From the company’s first 1.5 kilowatt residential rooftop installation in 2007 to the three 14 MW utility-scale solar-farms currently under construction in Ontario, Canada, AGT Solar has consistently grown the size of its project capabilities and experience. For more information about our commercial turn-key solar energy solutions contact us today. We have friendly solar experts on hand waiting to help. Advanced Green Technologies Vice President Clinton Sockman Earns Solar Industry’s Most Prestigious Certification – The NABCEP’s PV Installation Professional Certification. Fort Lauderdale, Florida – Clinton Sockman, Vice President of Advanced Green Technologies (AGT Solar), Solar Contractor, has earned the solar industry’s leading recognition of installation expertise from the North American Board of Certified Energy Practitioners (NABCEP®) and is now a NABCEP Certified PV Installation ProfessionalTM. NABCEP is a highly respected and well-established national certification standard for solar energy professionals. Designation as an NABCEP PV Installation Professional is widely recognized to be the most prestigious and meaningful certification of its kind in the solar industry. To obtain Clinton Sockman’s NABCEP certification, he was first required to document important knowledge and experience pertaining to PV system installation. Then he had to pass a rigorous exam that includes the breadth of the knowledge, skills, and abilities required to competently design, install and maintain PV systems. The exam assesses a wide knowledge on subjects including electrical and mechanical system design, job site safety, the National Electrical Code, roofing and construction techniques, and system maintenance and troubleshooting. Advanced Green Technologies grew its total commercial megawatt installed to 95MW in 2013 and projects 2014 to be a record setting year. Advanced Green Technologies (AGT), solar energy contractor, today announced an update on the Company’s total Megawatts (MW) deployed and projected outlook for 2014. In 2013, AGT completed 35 projects bringing its total Commercial Megawatts installed up to 95MW. AGT attributes their success to two important factors, getting back to its construction roots and further strengthening its relationships with development partners. 2013 commercial solar installations in North America totaled more than 7.5 MW. AGT entered into a Joint Venture Partnership with Moss Construction to form AGT-Moss Solar. AGT-Moss Solar specializes in the deployment of commercial/industrial ground mount solar photovoltaic solutions in Canada. AGT Vice President Clinton Sockman earns Solar Industries Most Prestige Certification: the NABCEP’s PV Installation Professional Certification. AGT currently has 50 Rooftop Projects (24 MW’s) under construction in North America. AGT currently has 6 Ground Mount Projects (74 MW’s) under construction in Canada. AGT will look to win awards for top solar contractor at both Solar Power International and Solar Canada. For more information about Advanced Green Technologies 2014 solar outlook contact us today.